"More than 1,000 middle and high school students in Oklahoma take classes online, with some earning their diplomas solely through virtual schoolwork," Wendy K. Kleinman reports today in The Oklahoman. "The students' options include online high schools offered by a charter school, a local company, a public school district and a university." "It's becoming the fiber of education, says Jeff Elliott, president of Oklahoma City-based Advanced Academics. "It's beyond a trend now." Yesterday the Friedman Foundation, OCPA, and eight other organizations released a public opinion survey which indicates that Oklahomans would like to have more school choices. As is customary, we also distributed a press release to media outlets throughout the state. This resulted in a fair amount of media coverage (see, for example, this Associated Press report). (a) "Thanks for sending this press release. I want to do a story, but I am skeptical of the survey's methodology and would like to arrange an interview with you in order to explore some of my questions." If you guessed (b), you are correct. Now, my graduate J-school program was many moons ago, but I seem to recall that this type of epistolary missive could be considered violative of the journalistic Code of Ethics. One would hope that the newspaper's publisher, who himself is very involved with (and even chairs a committee of) the Oklahoma Press Association, would seek to discover which journalist on his staff sent this e-mail so he could rectify the situation. Journalists tend to be pretty sensitive about being considered "professionals," sorta like doctors or lawyers. This kind of behavior doesn't exactly help their cause. "As the political season winds to a close," Greg Forster writes, "let's survey the results:"
That's three new programs, two expansions of existing programs and an upset victory in DC. Pretty good for a dead movement, wouldn't you say? Michelle and Barack Obama send their children to an elite private school, saying it's "the best option for our kids." Three cheers for Democrats everywhere who choose the best option for their kids. Will Obama speak up for the children? was busy working. He was a Jersey City fireman. He also drove a beer truck for Ballantine and he had a third job painting apartments. He did this so he could help send me to a private Catholic high school because the public school system in Jersey City was so bad. He did it because he wanted me to be the first Eschbach to get a college education. He sacrificed a good part of his life for me. They don't have enough money to buy textbooks, but they do have enough money to build multimillion-dollar athletic practice facilities. Even the most indigent of plaintiffs can afford a sports palace! Anthony B. Bradley, an assistant professor at Covenant Theological Seminary, discusses them here. OCPA trustee Bill Price has a weekly radio commentary Wednesday mornings at 7:45 on KOKC, Talk Radio 1520. Be sure to tune in tomorrow to hear him discuss school choice in Oklahoma. The Alliance for School Choice points out that four states -- Arizona, Iowa, Pennsylvania, and Rhode Island -- either expanded or improved their tax credit programs last year. "It is indeed telling," says Alliance president Charles Hokanson, "that the first three of these four states have Democratic governors, proof that school choice is more an issue of equality of opportunity than ideology." Yes, it's a silly little insert in the Sunday paper, but since some people read it Neal McCluskey takes the time to comment on this weekend's little article on homeschooling. According to the latest (April 2008) data from the U.S. Census Bureau, enrollment in the Tulsa Public Schools decreased 2.91 percent in the latest five-year period, while per-pupil spending increased a whopping 24.33 percent. ... for $48,556, or we could send one kid to the Plainview public school. In yesterday's Edmond Sun I argued for more school choice in higher education (we already have some school choice with Pell grants, OTEG grants, etc.). Tomorrow Governor Brad Henry and Treasurer Scott Meacham are going to announce a research project in which hundreds of Oklahomans receive seed money for their child's college savings. Let's hope this money can be used at private colleges and universities as well as public ones. UPDATE: Economist Mickey Hepner, a professor at the University of Central Oklahoma, blogs in favor of higher-ed choice. Another legislative session has come and gone, and again this year the education establishment was able to squash legislation that would have given parents more school choices. The New Hope Scholarship Act, which passed the Senate but not the GOP-controlled House, would have given a tax credit to Oklahomans who contribute to organizations that provide private school scholarships for low-income children trapped in 13 failing public schools in Oklahoma City and Tulsa. During floor debate on the legislation, Sen. Constance Johnson, D-Oklahoma City, asked a rather astonishing question: "Why is it that we want to take some of the kids out of the public schools and essentially leave the rest on the sinking ship?" The obvious answer was provided by another Oklahoma City Democrat, Rep. Rebecca Hamilton, during floor debate the following month: "Do you put people on the lifeboats (even if) you don't have enough lifeboats for everybody, or do you let them all drown?" The answer is clear. You save as many human beings as you can. "One by one, the (life)boats were filled with women and children, lowered and rowed away into the night, Titanic survivor Lawrence Beesley later recalled. After all, it was simply "common prudence" to get as many people as possible into the lifeboats and "row from the sinking ship to save at any rate some lives." Why would we want to take people off the sinking ship? Read through the list of Titanic survivors and ask yourself which of them should have been forced to go down with the ship. Five-year-old Lillian Gertrud? Nine-year-old William Coutts? How about Elizabeth Gladys Dean? 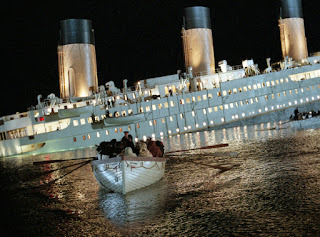 Then 9-weeks old, today at 96 she's the only remaining Titanic survivor. You think she's grateful someone took her off the sinking ship? Arguing against the New Hope legislation, state Rep. Scott Inman, D-Del City, told his colleagues that "if you select 10, 20, 40, a thousand kids and leave everyone else behind, you have abdicated your responsibility." The opposite is true. If you leave them all on the sinking ship, you have abdicated your responsibility. Benjamin Guggenheim understood this. As Guggenheim came to realize the Titanic was going down, the wealthy businessman asked a survivor to convey a message to his wife: "Tell her that my last thoughts will be of her and of our girls, but that my duty now is to these unfortunate women and children on this ship." Speaking recently in Oklahoma City, the black author and columnist Star Parker drew a different analogy. Comparing the school-choice movement to the Underground Railroad, Parker reminded her listeners that "Harriet Tubman was going one by one getting them out." And even if we can't get them all right now, "it makes a difference for the one we got out ... even if it means one child at a time." It will make a difference for the ones we can get off the sinking ship. "If I can help some of them," Rep. Hamilton said, "I'm going to do it." Today in The Oklahoman, I make the case that if the ship is sinking (and a Democrat senator has helpfully reminded us that it is), policy-makers have a duty to rescue as many children as possible.